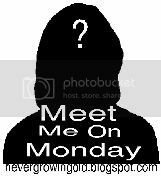 I'm hooking up with Meet Me On Monday and you should too!Just click on the icon below to read all about it and link up! One fluently, a second well enough to get in trouble, but I can count to ten in 12 languages - does that count? So have you answered these questions too? Even if you're not playing along, feel free to leave a comment here and answer one or more of the questions so that I can get to know you better!